Susanna Lindeborg, piano and keyboard, started her professional musical career at the middle of the 70th. 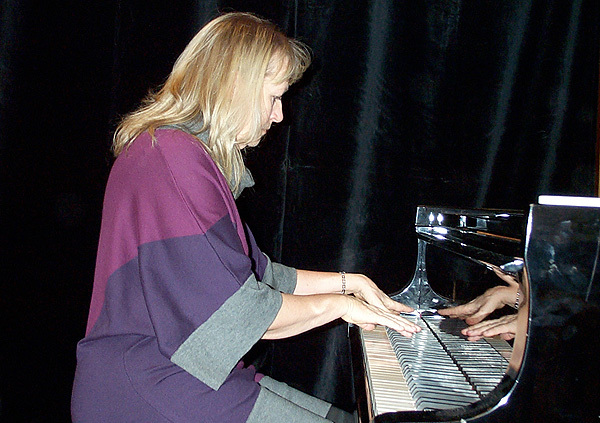 From her classical upbringing she turned into work with jazz and improvisation, which showed to be her right element. The thing you first think of together with Susanna Lindeborg is her work with the mix of acoustic and electronic instruments, which has been known most of all through the group MWENDO DAWA, which she is the leader of together with saxophone player Ove Johansson. Mwendo Dawa has been succesfully touring in 22 countries in Europe, North and South America and China performing at festivals like Montreux, Northsea and Montreal. The past few years she has been regularly visiting USA and Canada with Mwendo Dawa. Susanna also writes a lot of the repertoire for the group. Besides Mwendo Dawa Susanna Lindeborg toured a great deal with the female jazz group Salamander during the beginning of the 80th. Salamander arouse a lot of attention on the European continent and in USA and Susanna came to tour a lot internationally with these two groups. Today you can also hear her in the Lindeborg/Johansson Duo and Natural Artefacts. Susanna has been touring with Natural Artefacts and LJDuo with performances both in the world of improvisation music as well as the world of electro acoustic music. She also is doing solo improvisations together with her computers doing electroacoustical backgrounds. Susanna Lindeborg writes her own music and some of this got profiled when she released her first soloCD 1989. The CD got a lot of attention and gave her some work for instance in Germany with some radio and TV recordings. Susanna with her blonde appearance showed to hide a volcano under the surface. Where can you today hear piano better played than this? There are few keyboard players that approach the synthesizer with such a power as Susanna Lindeborg. Susanna Lindeborg showed not to be only a superb instrumentalist but she also shows to be a magnificent talent of composing. It is great that she - a lone woman - can create just that supplement of sounds and harmonics which she thinks the (very beautifully recorded) good old sounds of grand piano shall be accompanied by. It is lovely to receive noble analogue nice sounds together with the machines keeping other colourings in the background, or the opposite. Susanna Lindeborg is a refreshingly original voice that easily holds the listener´s attention for a full-length solo album: not an easy feat. "Mwendo Dawa at Northsea Jazzf"